Rookie Blue season 5 premieres on Thursday night on ABC. However, the air date was a month prior for Canadians, meaning some major spoilers are out. Episode 1 kicks off with Andy waiting for news about Sam’s condition. She and Dov leave to get a bite to eat, and have to deal with the diner they’re in being held up, but eventually make it back to the hospital. She breaks the news to Nick that she still loves Sam. She’s at Sam’s bedside when he wakes up. 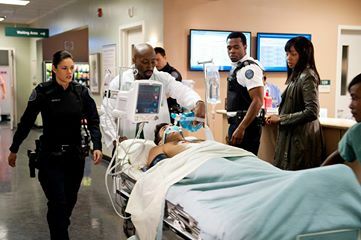 While Nick isn’t happy about the news, he still feels indebted to Sam for saving his life, and goes on a mission to locate Sam’s estranged sister who was next of kin, according to a recap from Global TV. Meanwhile, Dov waits alongside Chloe’s husband Wes for word on her condition after she was shot. She wakes up momentarily and asks for Wes, prompting Dov to take off and get that bite to eat with Andy. Chloe wasn’t happy with how long Dov took–even though it was because of the hold-up at the diner–and leaves a bunch of voicemails on Dov’s phone. Dov rushes back and Chloe tells him that she only asked for Wes first to get rid of him. As for Traci and Dex, things got heated when Leo was dropped off at the station at 4 a.m. by the babysitter because she forgot to pick Leo up earlier, due to a major issu at work. Leo called Dex, Traci’s ex, to pick him up, and Dex said he’d be calling a lawyer. Traci’s new boyfriend Steve called in a favor, trying to dig up dirt on Dex for custody purposes. Season 5 includes the introduction of two new characters–Oliver Becker as Inspector John Jarvis and Matt Murray as Rookie Duncan Moore. Also, Adam MacDonald (Det. Steve Peck) has been promoted to series regular. “It’s really tough,” Missy Peregrym adds of Andy’s love-life status now to Zap2It. “She left Nick to be with Sam in that situation, then was overwhelmed by how she felt about Sam. Nick can feel there’s still something there, and how does Andy stay with him when that’s so obvious?